Today was low mileage, high scenic value. 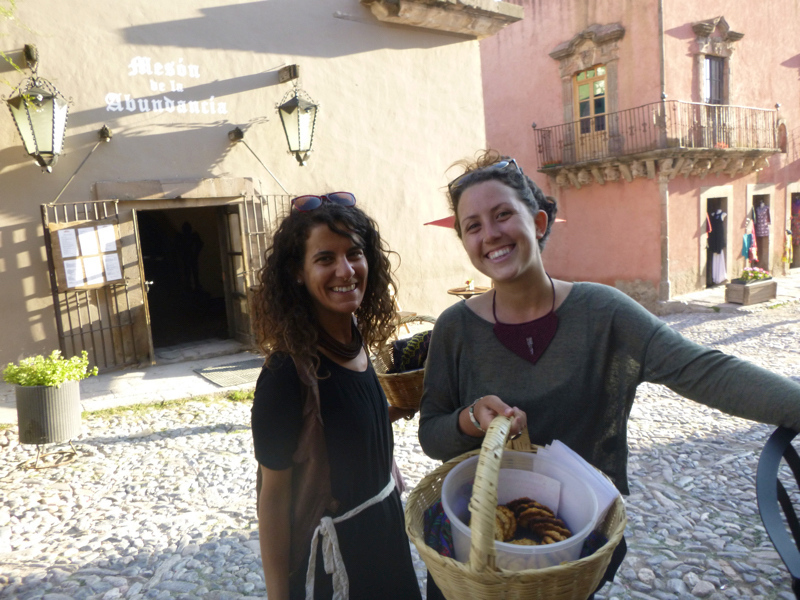 We left Galeana in beautiful sunny 60 degree weather and took a secondary paved road down through Dr Arroyo and over to Matehuala, then to Real de Catorce. The first 50 miles or so felt and looked like riding a backroad in Colorado. The mixture of various trees including large firs, and open meadows at altitude was refreshing. 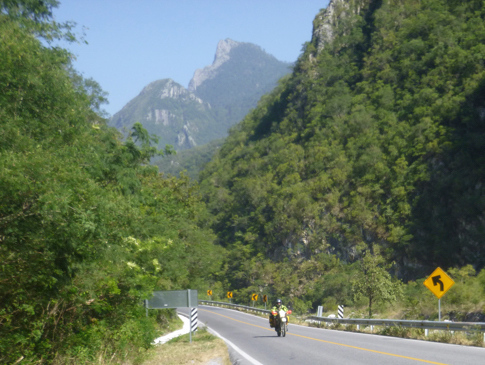 I decided that the ideal speed for riding paved secondary roads in Mexico is around 35mph. This allows you to see, gauge, and adjust route for the potholes, and it’s also slow enough not to miss anything, aside from missing the random donkey or dog in the road. A nice, comfortable pace. 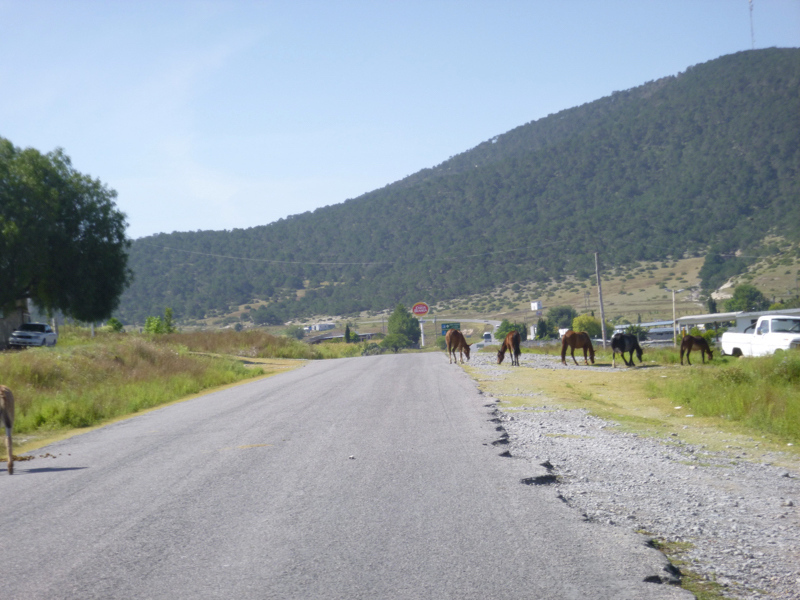 Cross Traffic: Donkey left, horses right. 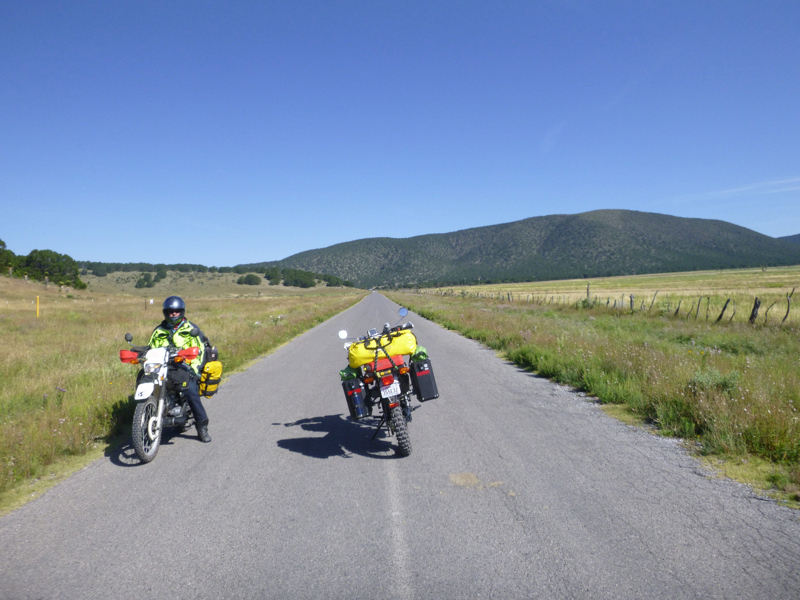 The ride from Dr Arroyo to Matehuala across the Altiplano is much more open. In Matehuala, we stopped for fuel and shortly after stopped at a traffic light where I saw another new sight: two guys in the crosswalk juggling about six bowling pins between them. I couldn’t grab my camera fast enough. It was absolutely smile inducing. As soon as the light changed, they grabbed their pins and moved out of the way until the next red light. The road from Matehuala to the turnoff to Real de Catorce reminded me very much of the Pearblossom Highway between the Cajon Pass and Palmdale, California. Straight road, very similar desert landscape and surroundings with mountains to the side. 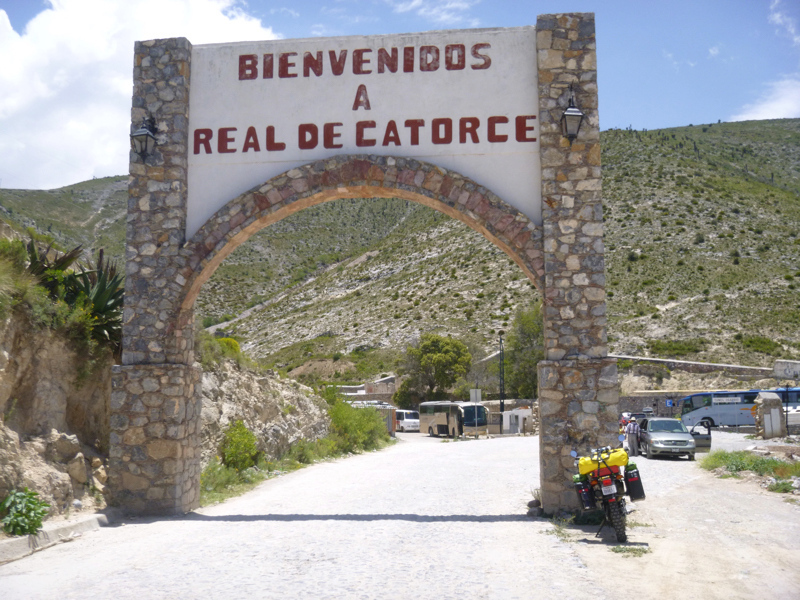 At the turnoff to Real de Catorce the road becomes cobblestone. Not the smooth, round cobblestone that normally comes to mind, like in Europe. No, this is sharp, jagged rough cobblestone. But firmly planted. 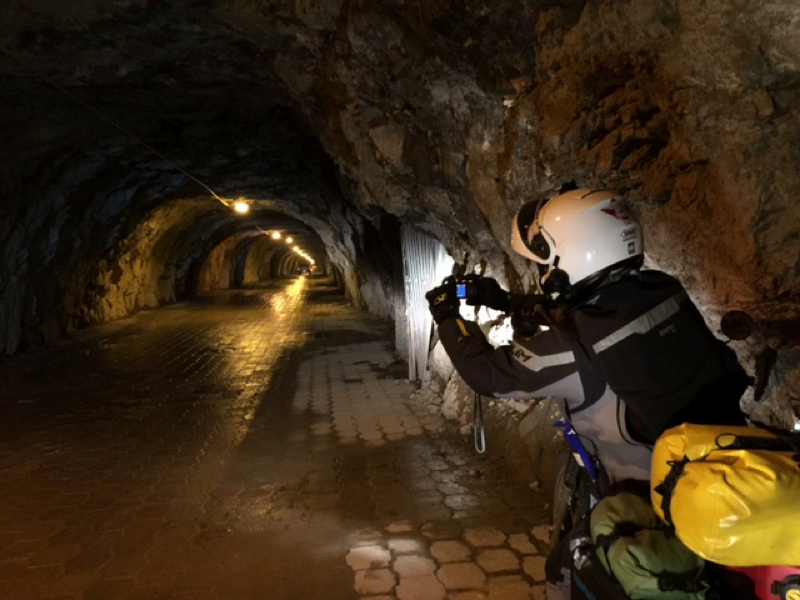 And it’s 12 miles long, up to the entrance to the Tunnel Ogarrio at 9000 feet elevation. The tunnel itself is worth the effort of the cobblestone road. Built between 1897 and 1901, it is a one-lane, 3km long tunnel with smooth brickwork pavement and lighting. 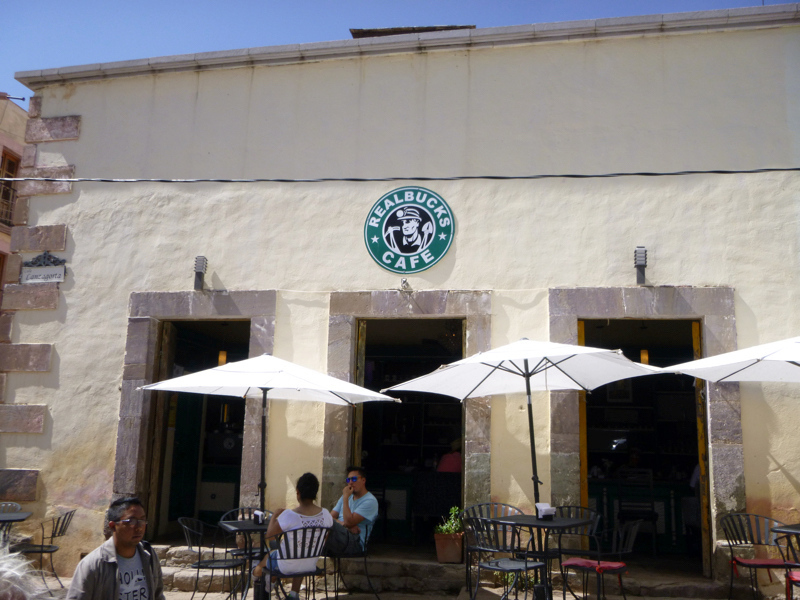 Real de Catorce is an old silver mining town that all but died off once, and has been somewhat revived as a tourist attraction. There are still a lot of old derelict buildings as well as many that have been brought back to life as hotels, businesses, and homes. 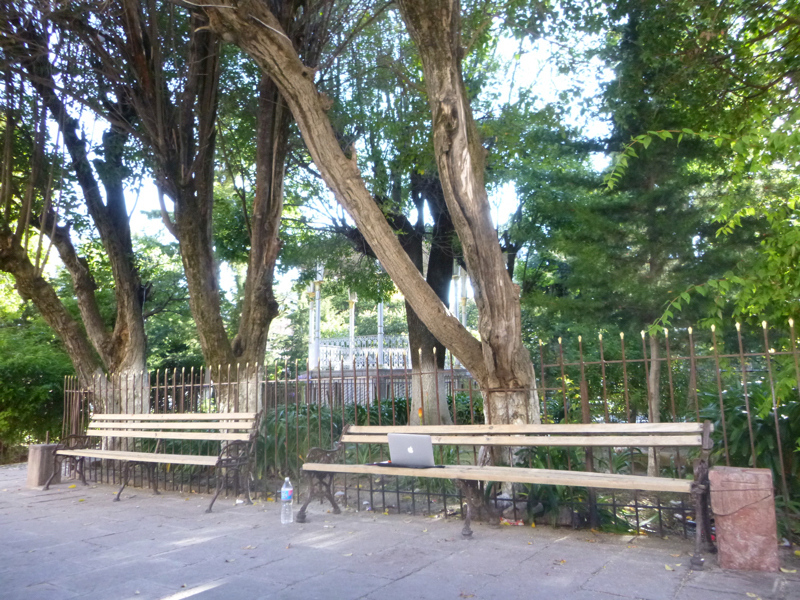 There is a very nice zocalo where I am sitting writing this in the shade of some huge trees. Afterwards I walked up to RealBucks to try to use their wifi. Unfortunately I was able to upload some photos but then got disconnected and never could get back on. While sitting there, two girls approached us selling cookies. It turns out they are one year into hitch-hiking around Mexico and have already been from South to North and are headed back south again. Real de Catorce is not very motorcycle friendly. 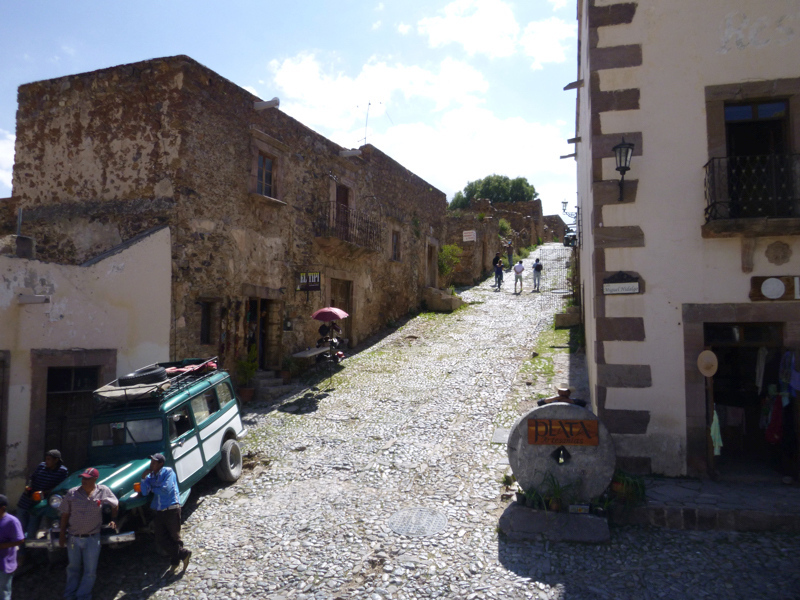 I don’t mean that the locals dislike motorcycles, but rather the town is built on the side of a hill and all of the streets are of the same rough cobblestone and steep, which makes for some interesting climbs and descents, not to mention parking. Hotels here are on the pricey side, so James and I are sharing a room at the (DUMP) name removed at $21 a night. 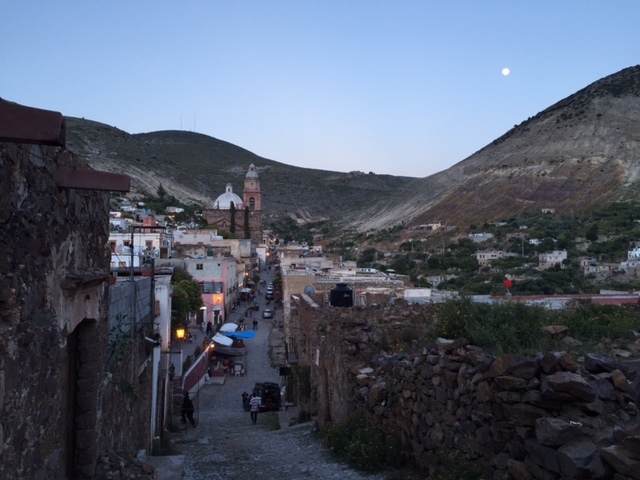 Today was my first day below my daily budget: fuel, food, lodging (my 1/2 of the room) and entrance to Real de Catorce ($1.25) came to just over $28. It was already (still?) stifling when I loaded up Tuesday morning to head for the border crossing at Anzalduas. At various times over the past year, this trip has morphed from a solo trip on a big bike to a two-person trip on a big bike, to a two-person trip on two small bikes, to a solo trip on a small bike. Now suddenly it was once again a two-person trip on two small bikes. At the very last minute, a new friend from Wimberley decided to join me for the first leg of the trip. 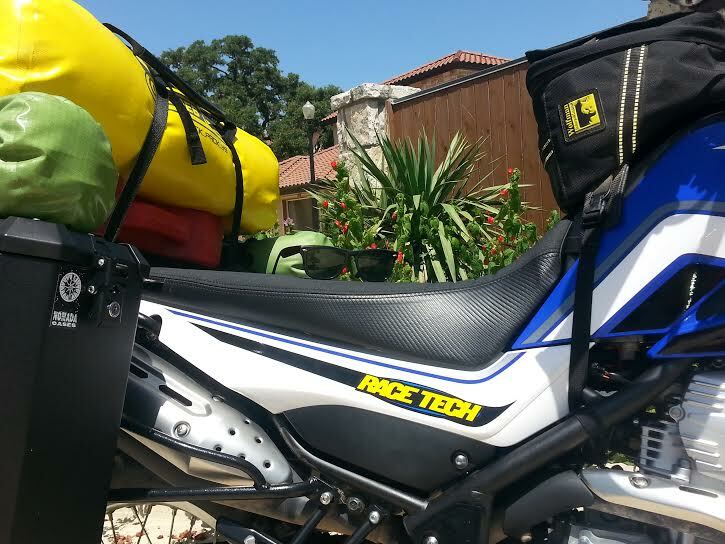 James showed up at my hotel Tuesday morning, his little XT225 Yamaha loaded like a pack mule. We’d only known each other for a short time, and had never ridden together. Now we were headed to Mexico for a month, and perhaps further. 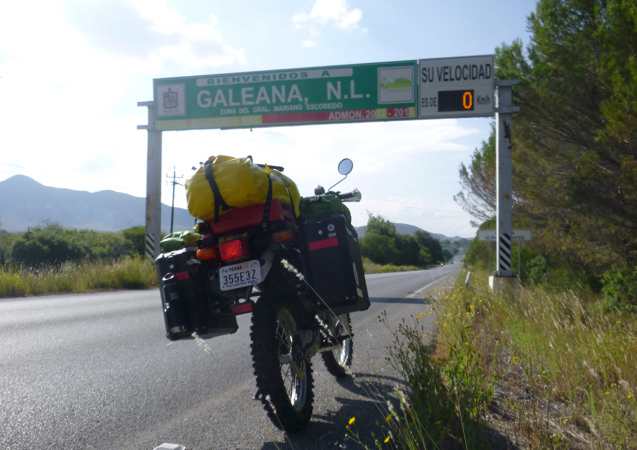 The heat finally subsided as we climbed into the mountains and rode into Galeana, to a familiar hotel where I had stayed a couple of months ago on a shakedown ride for this trip. By the time we arrived the temps were down into the 80s. After dinner we walked back to the plaza, and among the vendors was the same guy that was here when I was here in May, selling ice cream. Unfortunately he was out of Tequila flavored ice cream, but he had Mezcal flavored ice cream. It was still very good. The temperature had dropped to around 70 after dinner, and I was looking forward to a good night’s sleep. Wednesday would be the first day into new territory for me. I’ve been planning this trip for a year. Really planning. I’ve been thinking about it for most of my life, but for the past year I’ve been taking notes, researching places, prices, shipping, etc. Leaving came quickly. I was surprised actually at how, even though I had been moving everything into storage, the morning of departure suddenly came rushing at me. The bike was prepped. I was ready. Or so I thought. I wasn’t prepared for how hard it would be to say goodbye to loved ones, friends, co-workers. It was suddenly very real. 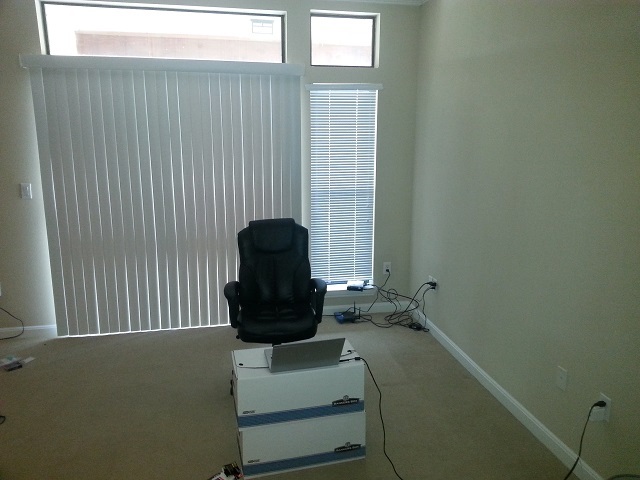 I had quit my job, sold most everything I owned, and now it was here: time to actually do what I had told everyone I was going to do. There was no fanfare. Nobody came to see me off on Monday morning. I got up from the floor of my apartment, where I had been sleeping on my camp mat and sleeping bag for the last few days, packed away the last few things, put on my gear, got on the bike, and rode away. Quietly. Sadly. It’s a feeling I can’t describe. And the 100 degree heat didn’t help. Neither did the brutal headwind. My little 250 was struggling. Yes, it was hot, and I rode just under 300 miles Monday from San Marcos, Texas to McAllen, on the Mexican border. I knew that I just had to ride Monday and Tuesday and once into Mexico it would get cooler. For those of you who think it just gets hotter as you go south into Mexico, there are actually some large mountains in Mexico. And that’s exactly where I was headed. Spent Monday night in Mission, Texas in a Motel 6. I remember as a kid that they were called Motel 6 because they were six dollars a night. So how come they aren’t called Motel 60 now? Hoping I don’t pay anywhere near that for a night’s stay for a long time to come. I wanted to get involved with helping less fortunate kids in some of the places I’ll pass through, so when I ran across Free Wheelchair Mission, it sounded like an opportunity I couldn’t pass up. This organization arranges the manufacture and supply of thousands of low-cost wheelchairs for those who couldn’t otherwise afford a chair, and works with distribution partners in areas all over the world to get the chairs to those in need. To date, they’ve supplied almost 900,000 wheelchairs in over 90 countries, but there are many millions of people who still need wheelchairs. The cost of one of their chairs is only $77.91. 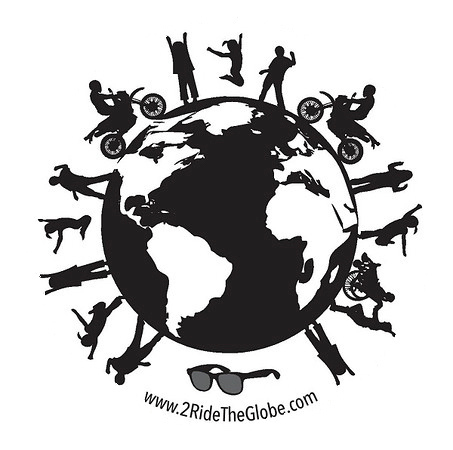 If you can afford to donate any amount to Free Wheelchair Mission in support of my ride around the world, I strongly encourage you to do so. I’m hoping that in addition to bringing awareness to this great cause, I will be able to contribute my time and hands-on skills somewhere along the way. I’ve created a fundraising page with a goal to raise enough money for 250 wheelchairs by the time my trip around the globe is over. Help me get started today. Last weekend was my last chance to enjoy Austin for a while. 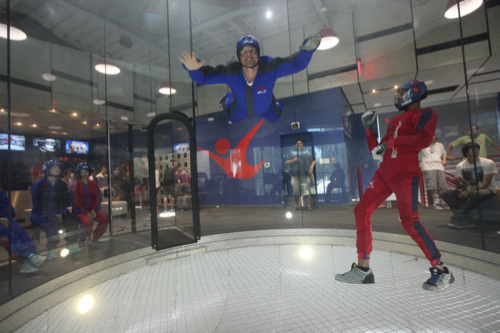 A friend flew in for the weekend and we had a pretty full weekend of fun, starting with indoor skydiving at IFly. Joe’s 1st flight: awesome body control! Then we headed to the ACL Live at the Moody Theater to see Buddy Guy. At 78 years old, Mr. Guy puts on a fantastic show. His opening act for a while now has been Quinn Sullivan, and if you haven’t heard of Quinn, Google him or check him out on YouTube. And don’t lose sight of the fact that this kid is still only 16 years old! 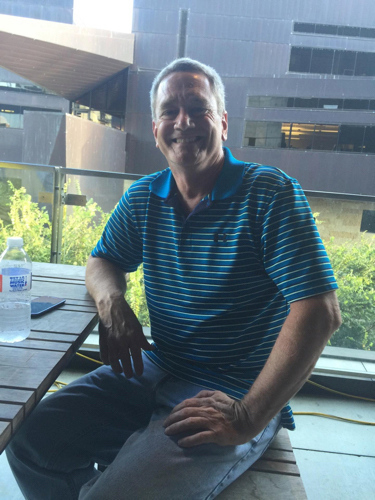 Sitting outside the Moody Theater before watching Buddy Guy play in Austin. It occurred to me while sitting there that this would be the last time I would wear jeans for at least a year, as I’m not packing any with me. All of that, another trip to Gourdough’s, and tubing on the river made for a nice time. But I’m back to final preparations for departure now. And of course now that I’m ready to go, the temps have hit the mid to upper 90s. Oh well… it only takes two days to get into the mountains of northern Mexico and it will be back to the 70s soon. I decided to have some stickers made that I could pass out along the way. Sort of a calling card so those I meet can follow along as well if they choose to do so. Clarke and Campbell at Bumperactive in Austin did a great job with these, including several different aspects of the trip. I hope to pick them up Monday and get them on the bike. My former father-in-law, Lloyd Bass, was an incredible man. Immensely humble, always smiling and joking, ready to help anyone, anywhere, any time on a moment’s notice. People as down-to-earth and solidly good as Lloyd are extremely rare. 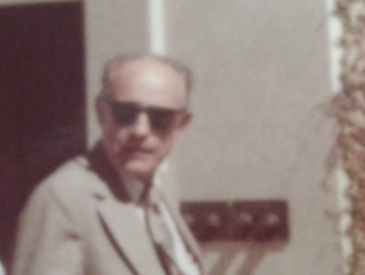 Lloyd and his wife Jean loved to travel. Even after he suffered a stroke which left him with limited use of his right side. he refused to slow down. They continued to travel the U.S. and abroad. Like most, we look back at the photos of our parents from years ago, and many are of their vacations and trips. In these photos, Lloyd inevitably was smiling that big grin of his, and often wearing his RayBan sunglasses. 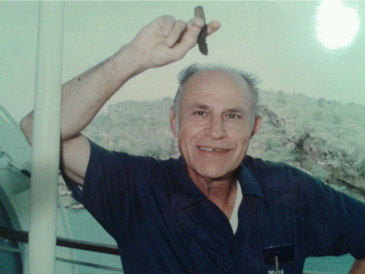 Lloyd passed away in December of 2005. Lloyd and Jean’s daughter, Ann, who has remained my best friend, recently gave me Lloyd’s RayBans, and told me that Lloyd would have loved to travel to the places I will go on this trip. So in memory of a great man, Lloyd will be riding along with me in spirit, and his RayBan sunglasses will make one more trip around the world. I spent the better part of last week in California at work. It was a somewhat difficult and emotional week, between meeting with HR to arrange for my “voluntary termination”, and saying goodbye to a lot of people I’ve come to know well over the past 27 years. It’s not the last time I’ll see most of them, but it may well be the last time I see them for a year. Being the workaholic that I’ve been, these are my friends and family. I’ll miss them. On a good note, it definitely felt like serious progress and commitment to moving forward with departure. I have an “exit interview” to conduct with my employer on July 23rd, and the next day is my last. So as of now, it’s looking like somewhere between July 25th and July 27th for the actual departure date. My travel health insurance starts July 15th, and my employer health insurance ends July 31st, so I need to get out of the U.S.
On an even better note, I’ve wanted to team up with a charity of some kind during this trip, and I found what I was looking for. I’m currently working with the organization to develop a plan, and will pass along more details very soon. I spent the past weekend saying more goodbyes. Old friends drove to Austin from out of state for a farewell dinner. It was great to see Will, and to meet his fiancee Ashley. They’re awesome people with an unbelievably great attitude and a bright future ahead of them. After Chickensh*t Bingo at the Little Longhorn Saloon, I had to take them to Gourdough’s Public House for “donuts”. If you’ve never had a dessert donut at Gourdough’s, you owe it to yourself to experience this place if you’re ever in Austin. More goodbyes this coming weekend. I’ve heard it a million times….”Life is what happens while you’re making plans”. Life changes. Plans change. Things don’t always turn out the way you expect, or hope, or want. In any case, due to a number of things, my departure has been pushed back a bit. The bike is done. The logistics are done. The paperwork is done. Still planning to get out of here this month, but I have a few more things that need to get done before hitting the road.